It's no secret that there have been a number of student walk-outs to protest gun violence after the mass shooting in Parkland, Florida last week. We also know that there are some major, national walk-outs planned for March 14 (the one-month anniversary of the Stoneman Douglas shooting), March 24, and April 20 (the 19th anniversary of the Columbine shooting). And since leaving school without permission, even for a good cause, is against the rules, some students may be worried about walking out and getting into trouble. A few school principals and superintendents have already spoken out, strongly, about this. The National Association of College Access Counseling has a listing of (at time of publication) 238 similar messages from schools. I replied to a tweet this week to ask for clarification, and I got to chat with a university dean of admissions. I asked if these messages were a response to nervous seniors who had been admitted and checked with the school about having their admission rescinded if they get suspended for walking out. I also asked if this type of pro-active signal is new and unique, or if she's seen this type of thing before. She told me that to her knowledge no admitted seniors had contacted the school. She also said she hadn't seen anything like this before. 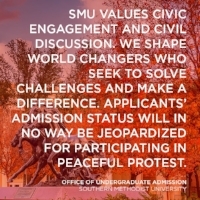 But she wanted to be clear that, even if there had not been a tweet, the school looks at suspensions and other disciplinary problems on a case-by-case basis, and they wouldn't let peaceful protest be a factor against an applicant any year, not just this year and this issue. Most of the replies and responses to the schools' messages have been positive. I've seen lots of "thank you!" and "I'm proud this is my alma mater" replies on Twitter. Some have been more negative. There have been a few responses along the lines of "would you do the same for people who protest in favor of gun rights?" First, it's hard to imagine high school students walking out of school to protest not enough guns in America. But if, hypothetically, they did, most universities would not hold the disciplinary action against you. Remember that most high school students try to fake or embellish their civic engagement for college applications. If you were suspended for actual civic nonviolent engagement, then schools aren't going to have a problem with that. I've also seen criticism from the left, mainly in the form of "you didn't make this type of announcement for Black Lives Matter or people kneeling for the anthem." That's a fair and accurate point: this does appear to be the first time schools have pro-actively made this type of announcement. Perhaps they'll do it more in the future. However, I couldn't find an example in the news of someone who had admission rescinded or denied because they had participated in a BLM event or for kneeling during the national anthem (leave me a comment if you know of one). And if it helps, remember that last year a student was accepted to Stanford who wrote "#BlackLivesMatter" 100 times for his essay. But still, not counting peaceful protest against and you announcing ahead of time that they won't are very different things. If you're a high school student who plans on participating in an organized walkout--for any reason, any year--there are some things you should think about ahead of time. Yes, you can get in trouble. In fact, you should get in trouble. That's part of the process. Central to the nonviolent civil disobedience movement in America is the idea of not only accepting, but embracing and celebrating, the legal consequences. Re-read Thoreau's "Civil Disobedience." Re-read King's "Letter from Birmingham Jail." Getting in trouble, raising visibility for your cause through trouble, and taking a moral stand against authority are key. So if you get suspended, accept that. It's the point. However, realize that the suspension may not be straightforward. You may have a discipline record that says "suspended for taking part in a nationally recognized civil protest," but it's not likely. If a school administrator tells you to go back to your classroom and you don't, then the suspension will probably have the legal language of intentionally disobeying a direct order made for your safety. And if a police officer on campus tells you to go back to your class and you don't, you may end up being charged with disobeying a peace officer. To the extent that you can, get the documentation to reflect that your suspension had to to with an organized walk-out. You'll need that documentation later. There are also plenty of reasons for school administration to want avoid a walkout other than disagreement with your cause. They are legally and ethically responsible for your safety, and even sympathetic administrators are going to try to minimize the number of students who leave campus, where they can be accounted for. I worked at a high school years ago that had a small walkout, maybe 20 or 30 students. I wasn't teaching that period, so I went out to the parking lot with them to see what was going on. One of the school's assistant principals was there, too, videotaping everything. And he came over to me and said something like "I have to be the bad guy and try to to get them back in and count them absent. That's my job. But try your best to keep them in the parking lot and not let them cross the street. There are cops over there, and if they get arrested for holding up traffic then I can't help them." He was completely sympathetic to the students and the issue, but he also had a job to keep them safe and out of worse trouble. Unless a teacher or administrator is being completely belligerent or violent, it's ok to assume the best about them, even if they want you not to walk out. They're not the enemy. No, you're not going to have your college admission jeopardized for taking part. But you're going to need to be ready to explain what you did and why. Colleges aren't going to see a suspension on your record and immediately assume you're a violent criminal. Nor or they going to see a suspension on your record and immediately assume you were part of a peaceful civil protest. They're going to ask you about the suspension, and you must be prepared to explain yourself well. It would be smart to write a statement of why you're going to walk out even before you do. Post it someplace where people can see it, like a public social media post. That way you have your own documentation. Lastly, please know that it's ok if you don't walk out. It doesn't mean you support school violence. It doesn't mean you're weak and succumb to authority. It means you didn't choose to address the mass shooting this way, which is just as valid as choosing to participate in the walkout. But if you do participate, please be careful out there! As a parent and educator and person, I want you to finish this school year safe and sound. That's what this is all about, after all. Thank you for reading. Please share this post with people you know. It's easy to follow Apply with Sanity on Facebook and Twitter.